You must admit that this is pretty unusuall situation - LED in a lightbulb, and it's all powered from mains. 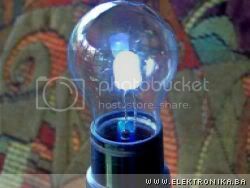 Old lightbulb was degutted and replaced with two LEDs in anti-parallel connection, with a capacitor and resistor in series. This resistor with capacitor is used to limit current through LEDs. Two LEDs were filed down to half-size and glued together to form a single LED. This step probably is not necessary but it looks cool this way. Please bear in mind that this device is powered from mains, so it requires a lot of respect when testing.